Until the early 2000s, the process of booking a holiday involved trips to multiple travel agencies, hours thumbing through glossy brochures, and more sit-down meetings than the average mortgage currently requires. Today it’s a task that can be completed on a mobile phone during a coffee break. There are many reasons why the travel industry experienced such a shift, from the lure of competitive prices to the convenience of consumers becoming their own armchair agents. People simply wanted to take more control. Seeing the same demands echo throughout the finance and mortgage space, the co-founders of Australia’s first “cloud-native digital bank” – ex-NAB execs Nathan Walsh and Michael Starkey – believe it’s time the finance industry saw the same shake-up. “Athena’s mission is to make the journey to homeownership faster, cheaper, and less stressful,” says Walsh. While it’s good news for consumers, it’s another innovation that could be bad news for brokers. Last month, Moven co-founder and CEO Brett King predicted that even smart speakers would be inching in on the broker space in the future as customers look to limit the number of transactions in the homebuying process. Speaking to Australian Broker, King says, “Ideally, what would happen is by the time you walk into the display home or village we know where you are and there’s a good chance you’re in the process of buying a home. So then we have to look for the behavioural trigger that indicates you’re ready to make a purchase on the home. Moven and Athena aren’t the only fintech platforms making headlines this year. Recent months have also seen the launch of Australia’s first digital bank, volt, which promises to develop “better, more honest products and services” to give consumers greater control of their money. Both Athena and volt have specific plans for the $1.7trn nationwide mortgage market and boast some heavyweight credentials. In May, Athena raised $15m in Series A funding from Macquarie Bank, Square Peg Capital and Apex Capital, and APRA introduced a new restricted ADI, or RADI, licence to enable the launch of volt. Other start-ups, such as BlockX, have also received backing from the majors. Anja Pannek, CEO of aggregator PLAN Australia, says, “Every month there is another article on a new digital disruptor in the market, and we have a number in the market at the moment who have built significant platforms and have quite a bit of backing. According to data from MyState Bank, 13% of surveyed brokers believe online platforms do not pose a serious threat to their business models and 47% plan to remain focused on their current models. However, more than 22% of brokers are adopting new technology and software to remain competitive, and 5% are looking to partner with fintechs to improve their client offerings. Such findings underline the different levels of fintech adoption currently seen across the industry: while some brokers remain true to their traditional approach, others are leveraging new tools to offer hybrid services that blend old and new. In banking, major lenders are both backing and competing with the fintechs. In May, NAB unveiled its QuickBiz for Broker platform that enables brokers to digitally apply for unsecured business finance of up to $100,000 on behalf of their small business clients. The bank’s tandem introduction of the ApplyOnline tool will also help brokers offer their customers. It isn’t the only innovation from the big four. ANZ has partnered with Loanapp, a new e-lodgment tool for brokers to submit residential mortgage applications, which Simone Tilley, GM of the bank’s residential broker division, called “transformational”. But NAB’s general manager of broker distribution, Steve Kane, maintains there is still a place for traditional, branded banking – as well as brokers – and that will be the case for some time yet. “The issue is conversion. 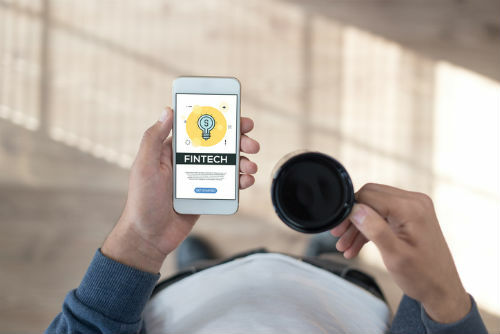 The fintechs have leads, they have people interacting with them, some have in-house brokers, but they struggle to commercialise that,” says Kane. The synergy between lenders and their apparent fintech competitors may seem disparate at the moment, but the fact that several majors have taken stakes in digital banking start-ups may signal where the industry is heading: the nimble and independently branded companies will be funded to test drive tomorrow’s software ahead of a major acquisition further down the line. What remains to be seen is how the hybrid broker model that is emerging in the interim will fit into the equation.